Garage Sale Checklist | Tips and supplies for the perfect yard sale. 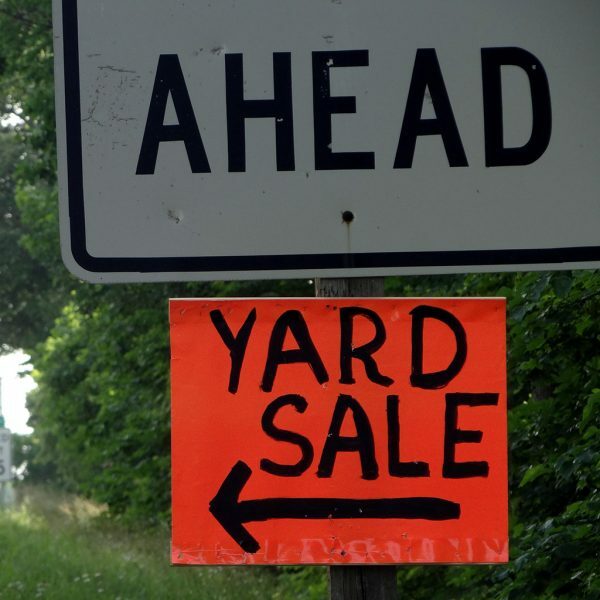 Do you have what you need for the perfect yard sale? Before you bother with the rest of it, make sure you've got enough stuff to sell! If you can't fill at least a few tables, go back, purge, and start again. It's the all the little things that you don't think of until it's too late to run back to the store to grab them. Sit and make yourself comfortable; you'll be doing a lot of it. Tables to are to put your stuff on, no one wants to pick it up off the ground. Be sure to get a cashbox, and start off with a fistful of coins and small bills to make change. If you've got a smartphone, you can even easily accept credit cards. 690,000 people buy an item at a garage sale each week. 165,000 yard sales are held each week in the United States. 95,000 garage sales are listed on Craigslist weekly. Yard sales bring in a total weekly revenue of $4,222,375. Average price of an item at a yard sale: 85¢. Saturday is the best day of the week to hold your garage sale. Stuffed Animals, Televisions, and Magazines. Tools, Collectibles, and Sports Equipment.